Multisided markets typically serve distinct sets of users, all of whom benefit from having each other on the platform. In the case of software platforms, the platform developer wants to attract both application developers and end users. Similarly, a shopping mall developer needs to incentive both merchants and shoppers to use the mall. In both cases, the platforms lower the cost of providing services by reducing duplication of services such as parking. “Invisible engines” are software platforms, software which makes services available to other software through Application Programming Interfaces. The authors look at software platforms and multi-sided markets through an economic lens. Other examples of multisided platforms are cash (a government structure which allows buyers and sellers to interact efficiently) and credit cards (Visa and Mastercard create platforms for merchants and consumers). Indirect network externalities play a key role in multisided markets. Indirect network effects mean that an increase in the number of users of one component makes that component more valuable as a complement to other components. Direct network effects mean that an increase in the number of users of an application or platform makes that service more valuable for all users. Credit cards, for example, are more valuable when a large number of merchants accept them and a large number of consumers use them for payment. Platform operators can capture indirect network externalities by serving as matchmakers, building audiences, and reducing costs by providing shared services for the participants on both sides of the relationship. Many times the incentives and costs are different for the parties involved in a multisided platform. Multisided businesses often charge one party far less than the other, or nothing at all. Magazines earn more from advertisers than from readers and real estate brokers earn more from the seller than the buyer. The authors also discuss multihoming–a case where at least one of the parties participates in multiple networks. Examples are merchants who support both Visa and Mastercard or game developers who create both Xbox and PlayStation versions of their games. In some markets, multihoming is more prevalent than others. It’s natural for gamers to play with multiple consoles and can increase overall game usage through diversity of options. If you go to Silicon Valley and want to start a company, you’re much more likely to get funded if the word “platform” appears very often in your business plan. And if the word “multi-sided” appears, you’re really, really likely to get funded. In the presentation above, Andrei Hagiu discusses the differences between multi-sided platforms versus traditional intermediaries and platforms. He defines a multi-sided platform as an organization which “creates value primarily by enabling direct interaction between two or more affiliated groups of customers.” Direct interaction means that both parties have to maintain control rights over the interaction. Interactions can include a contractual relationship, a product purchase, or communication (e.g., match.com or advertising). The requirement of direct interaction is what distinguishes multi-sided platforms from re-sellers (e.g., grocery stores and retailers). Affiliation is an important defining characteristic because many traditional intermediaries like Wal-Mart do not support affiliation between participants (in this case suppliers and consumers). The affiliation requirement separates multi-sided platforms from input suppliers (e.g., e-ink suppliers for the Kindle). Hagiu gives an interesting example of the kindle where the e-ink supplier, although a critical component in device, only has a relationship with amazon, the manufacturer, but not the readers or the publisher. That makes the e-ink provider a supplier, not a platform. To become a platform, the e-ink supplier would need to either declare a proprietary standard and require publishers to establish relationships with them or they would need to create an e-book store and establish relationships with consumers (readers). Neither amazon nor Sony would allow this to happen. So the e-ink supplier must continue to go through a powerful distributor such as amazon. Multi-sided platforms create environments where two parties can have a relationship. By contrast, a traditional intermediary has individual relationships with both parties, but the parties don’t have relationships to one another. Amazon started as a reseller—they sold goods directly to consumers. Their next step was to establish a marketplace where they facilitated consumers meeting merchants. Amazon moved this direction so that they could decrease costs and increase profitability with the multi-sided market model. Hagiu points out three market attributes to consider when deciding between a multi-sided platform and traditional re-seller model: quality and long tail demand; profitability and growth; and buyer demand and preference. For goods that are rare and in low demand, a multi-sided platform approach (e.g., eBay) is a better fit. On the other hand, if the quality of goods is more certain, a re-seller model will work well. Multi-sided platforms can offer higher percentage margin than the re-seller model due to a lower cost basis. If customers have a preference for higher touch service and there are high degrees of complementarity between goods, then the re-seller model is a good choice. Published in 2006, one year before the introduction of the iPhone and two years after the founding of facebook, this book looks at software platforms through an economic lens. The early chapters of the book contain a description of programming languages, operating systems, networks, computers in general, APIs, and Open Source. The next few chapters are dedicated to case histories of 1970’s to early 2000’s computer industry history including programming languages, operating systems, mobile phones, personal computers, digital music players, and digital music platforms. These case studies feature Palm Pilot, iPod, RealNetworks, Microsoft, Apple, and DoCoMo. The last section of the book discusses key decisions that platform owners need to make. First it the scope and level of integration that the business undertakes. Second is pricing, enticing all parties to participate, and overall business model. Finally, features and functionality for the platform must be selected. 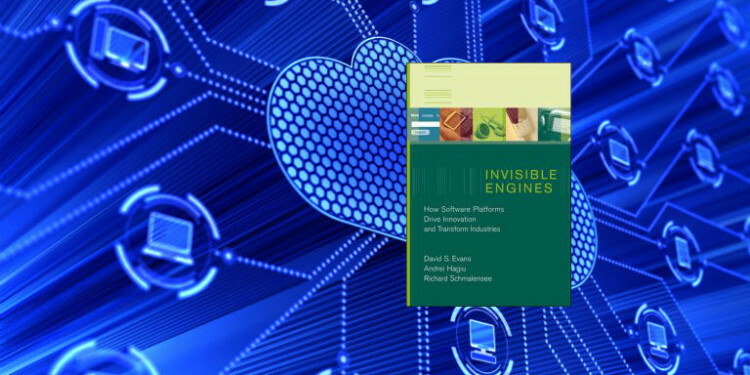 Invisible Engines was one of the first books on platforms and contains analysis and models that are still relevant. Although the examples are all pre-2006, there’s a lot of history to enjoy and compare to today’s landscape.It is limited in scope relative to books like Platform Scale by Sangeet Paul Choudary and Platform Ecosystems by Amrit Tiwana, but it’s an interesting portrayal of early platform pioneers. Invisible Engines focuses on economics, business models, and industry case studies. Platform Scale covers the dynamics of platforms, their underlying models, and how to achieve growth. Platform Ecosystems is a vast textbook that covers all aspects of platforms from technology through governance.